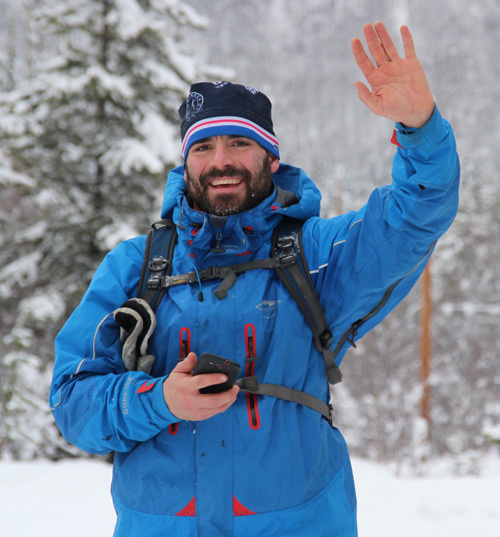 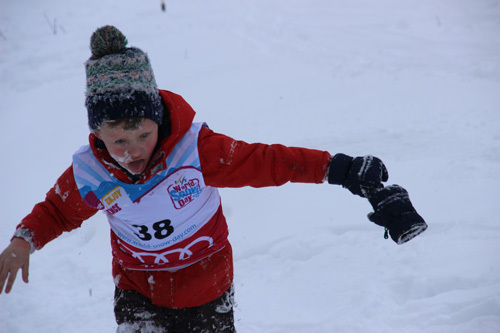 Celebrate the fun of playing in the snow in this worldwide event – Experience, Explore and Enjoy SNOW!!! 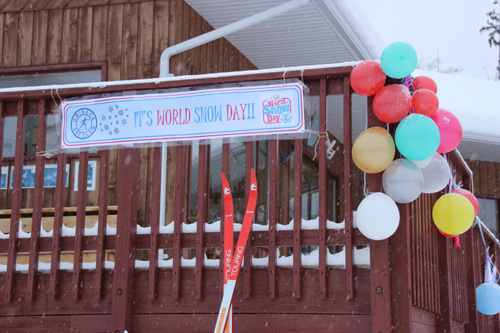 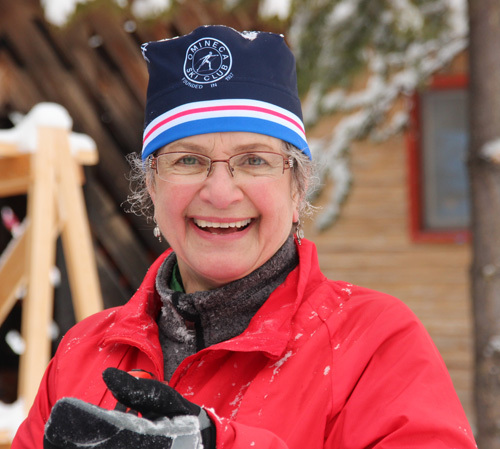 World Snow Day will once again exceed 600 events. 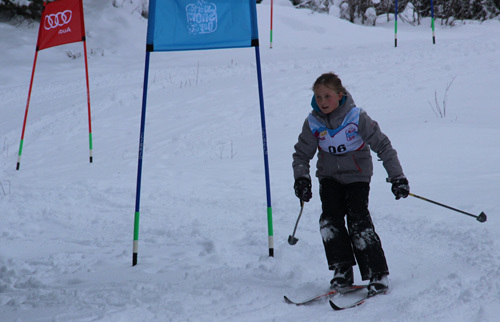 The nationwide events include: ‘Apen Bakke’ (Open Day) in Norway, where 100 resorts will open their doors to an estimated 130,000 participants for free skiing and snowboarding; School snow sports concept in Austria includes 125 resorts offering school children the chance to try snow sports for as little as five Euros; while in China 20 resorts across the country – increased from five resorts last year – will support free and discounted passes for children. 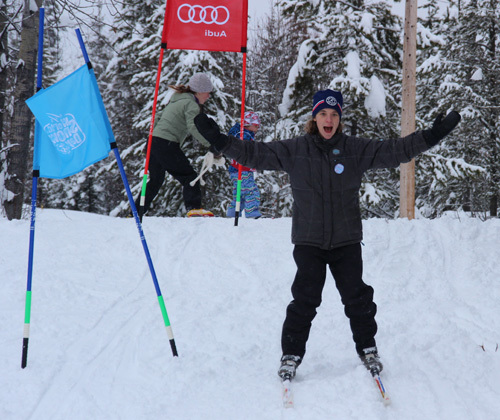 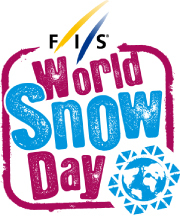 World Snow Day is sponsored in part by FIS (the International Ski/Snowboard Federation) and many people braved the snowfall (go figure!!) 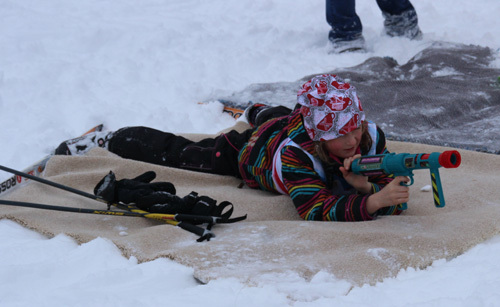 to come out and join in the fun of playing in the snow. 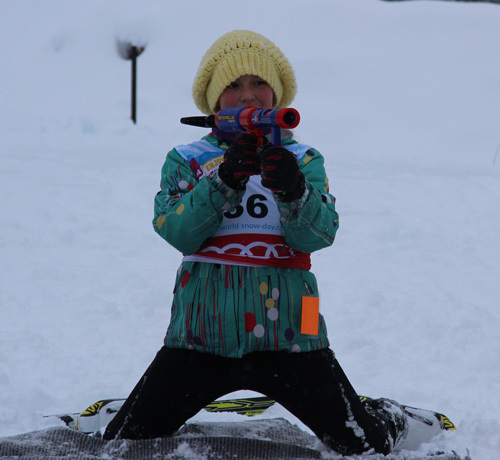 The kids circulated around a whole bunch of fun activity centers such as a slalom course, ski jumping and a terrain park, toboggan hill, target shooting marshmallows at the biathlon range, the ‘horse and cart’ and lots of games of ‘moose calf’. 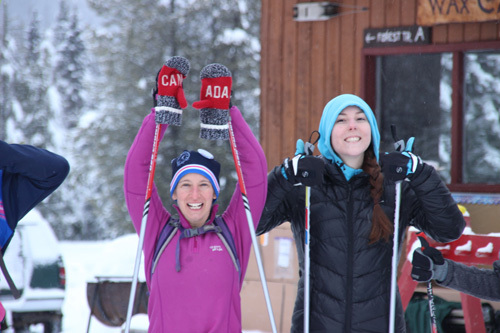 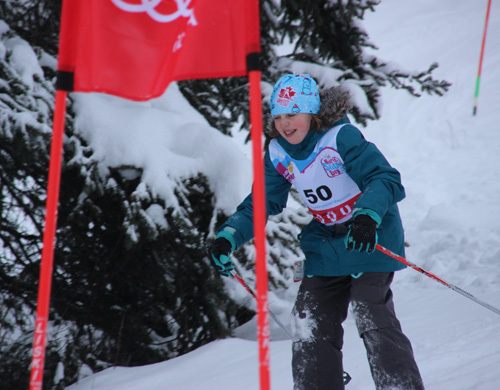 And thanks to the generous donation of the slalom poles and flags, vboards and tent from the FIS we have some new equipment to use at future events. 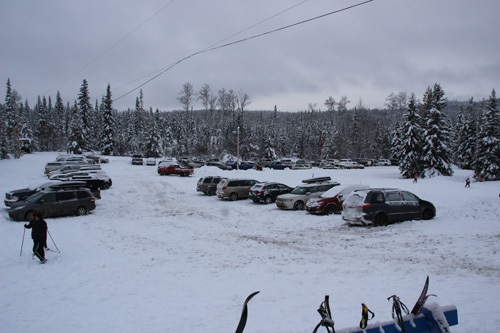 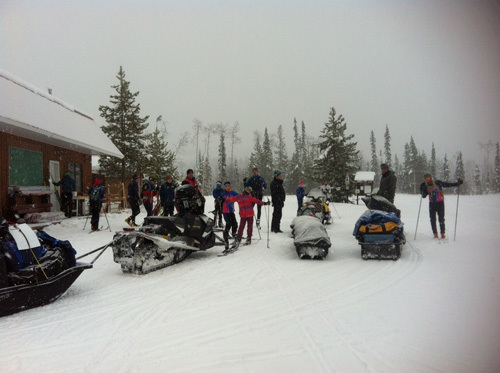 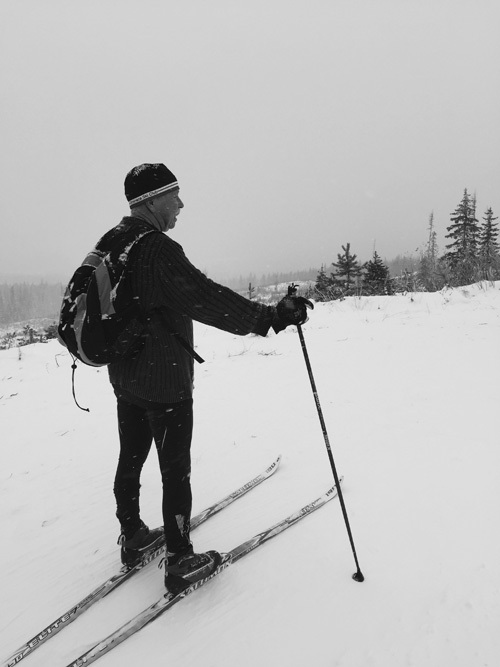 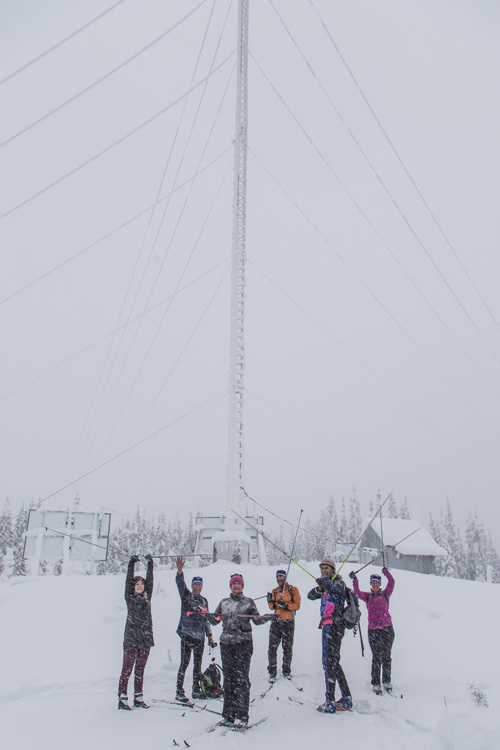 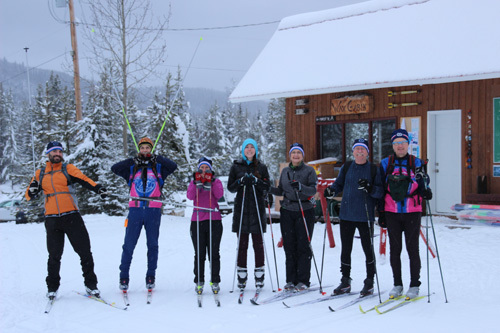 As part of World Snow Day just over 30 skiers and a couple of snowmobilers (support team) made the trek up to the Spud Tower. 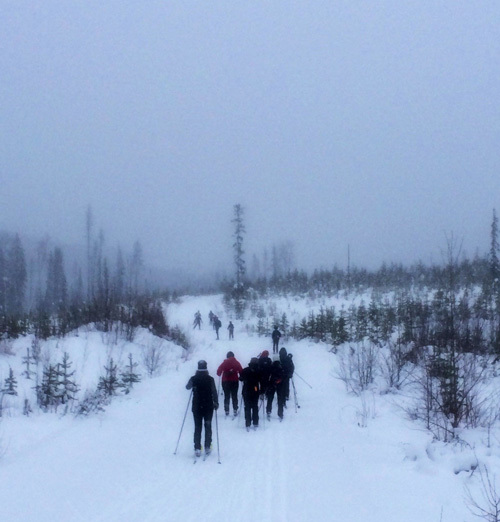 It is about 24 km round trip (depending on the route taken and the Fitbit worn). 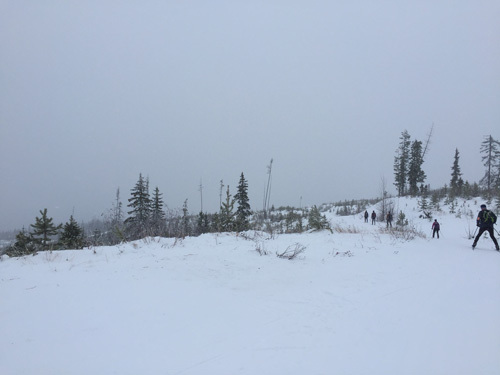 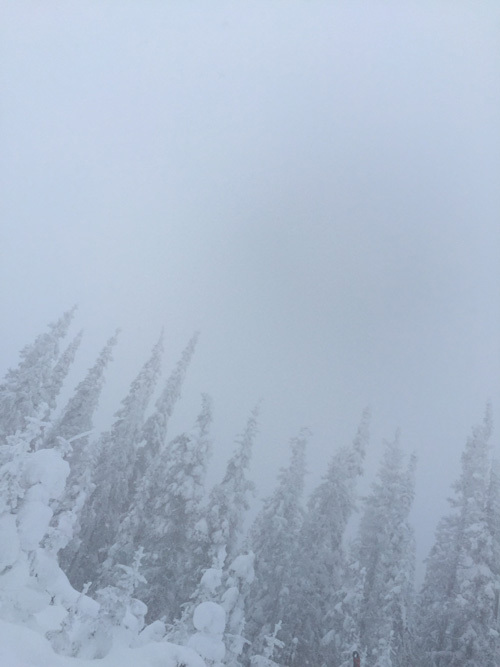 They braved the constant snow and hard winds to make it to the top and the view was…fog. 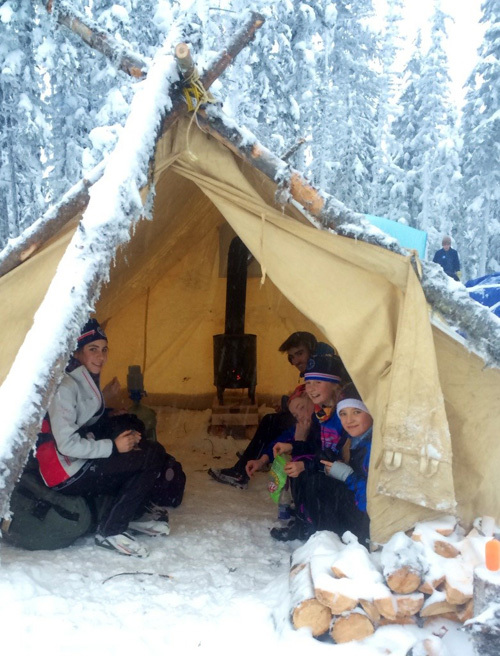 A group of 17 spent Saturday night in tents but they had a warm campfire, lots of ‘smores and a great fireworks display. 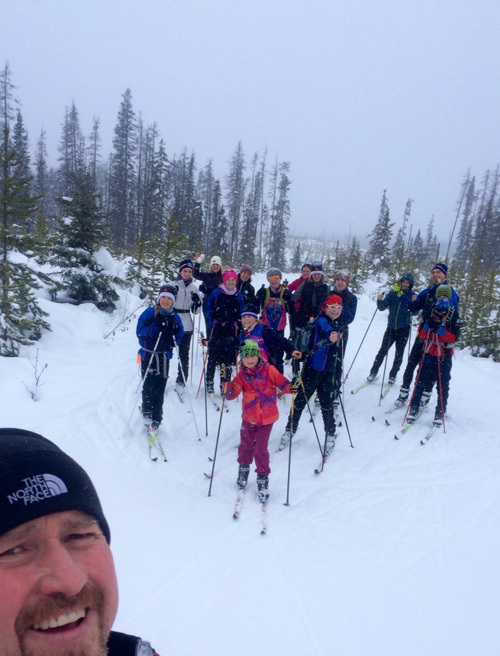 Then Sunday another group of 11 went up the trail for a day tour. 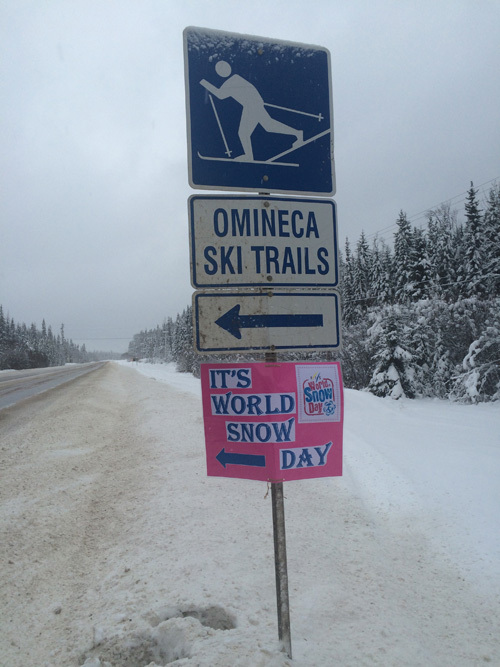 Cheers to the hardy Canadians eh! 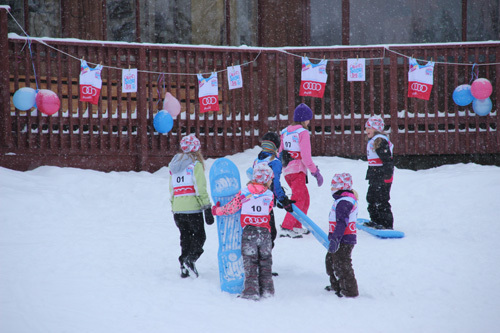 Working in parallel with World Snow Day, SnowKidz is the first phase of the Bring Children to the Snow (BCttS) campaign. 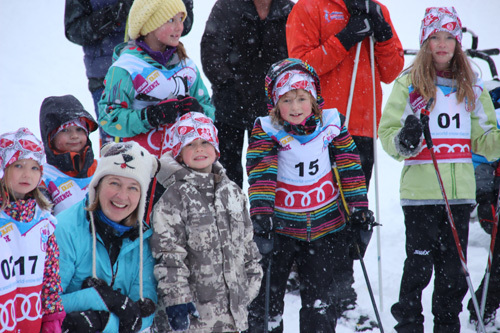 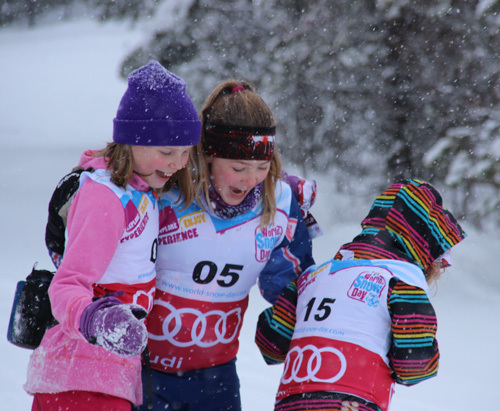 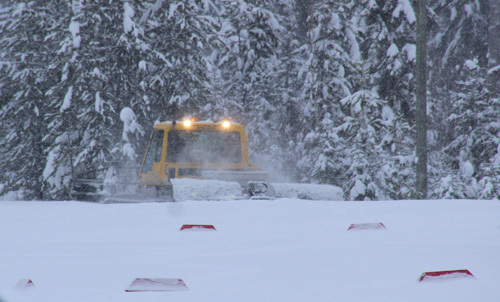 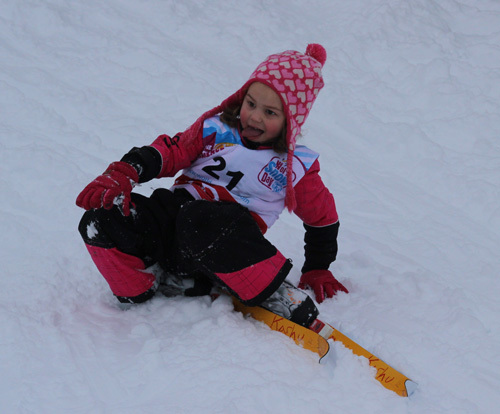 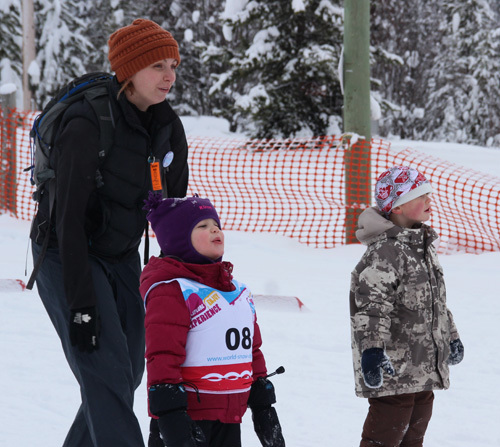 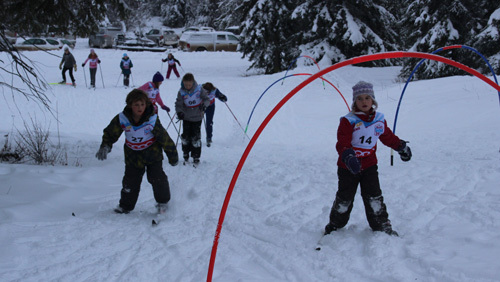 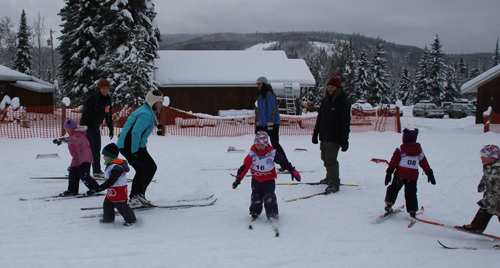 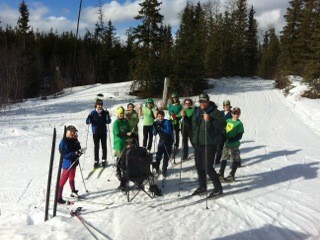 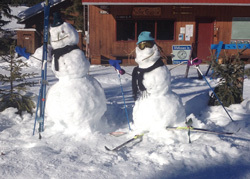 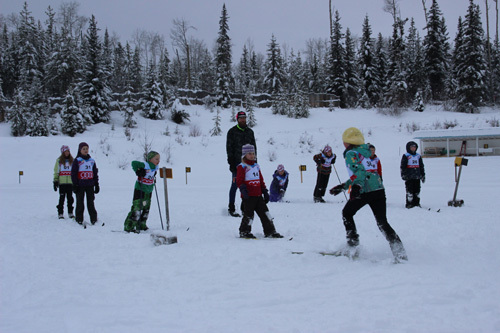 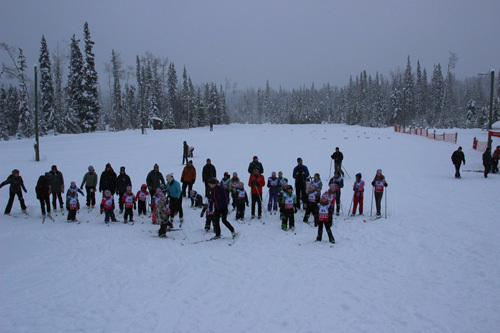 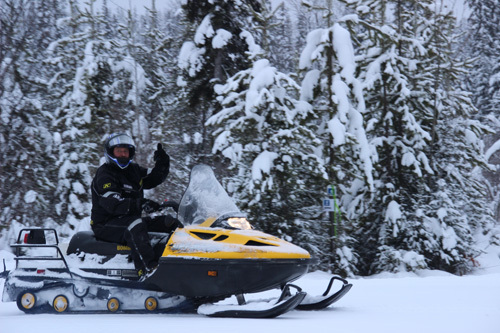 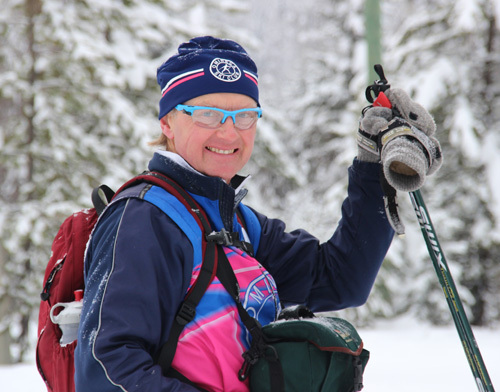 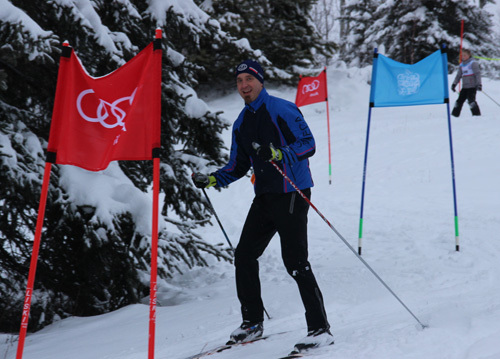 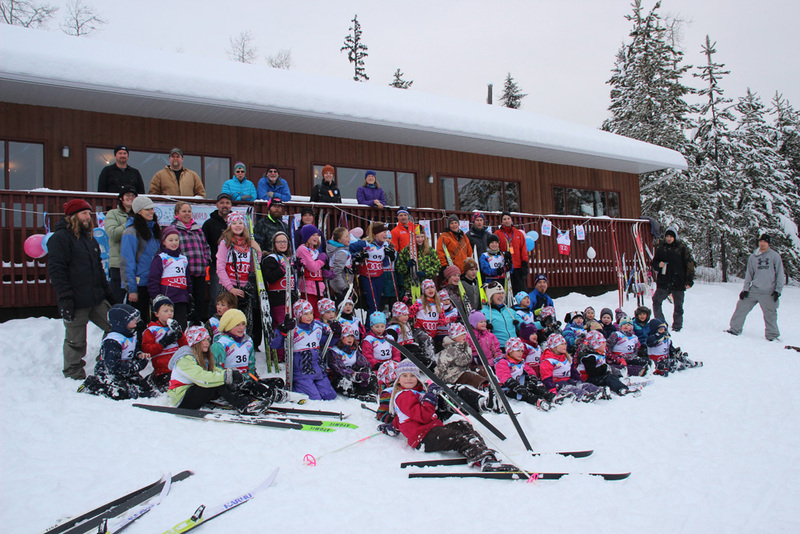 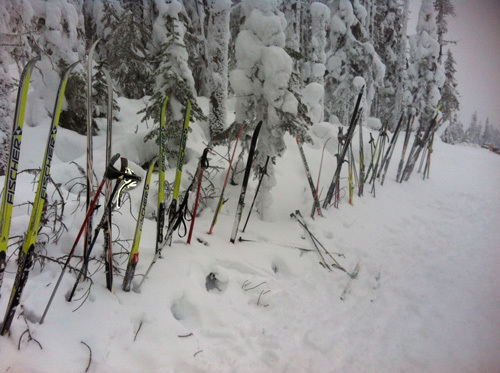 Started in 2009 the SnowKidz project set the test events for the BCttS campaign in its early year. 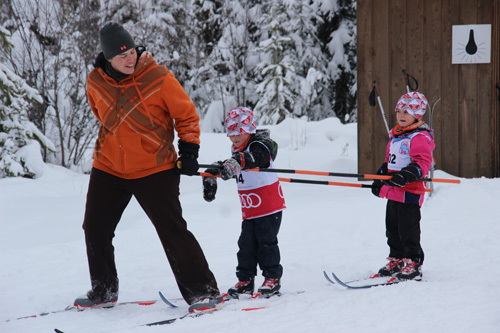 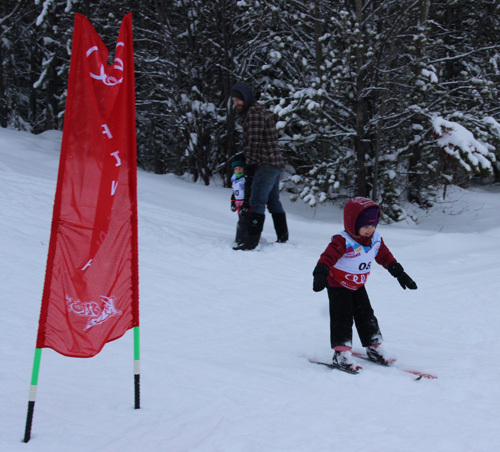 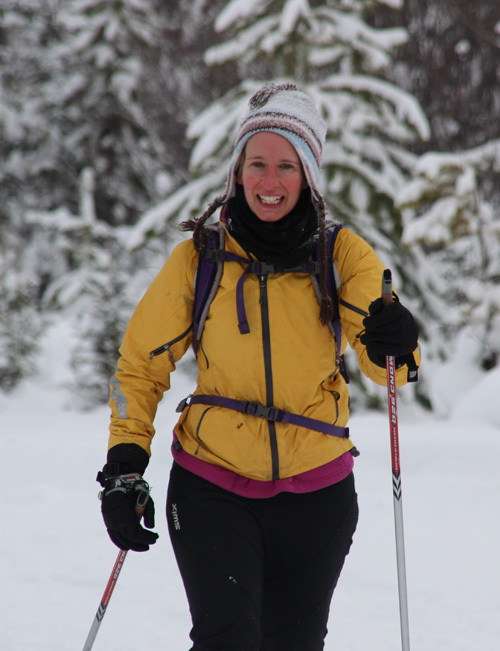 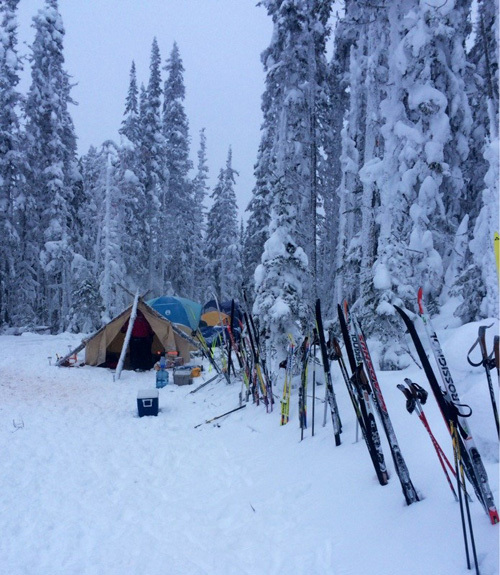 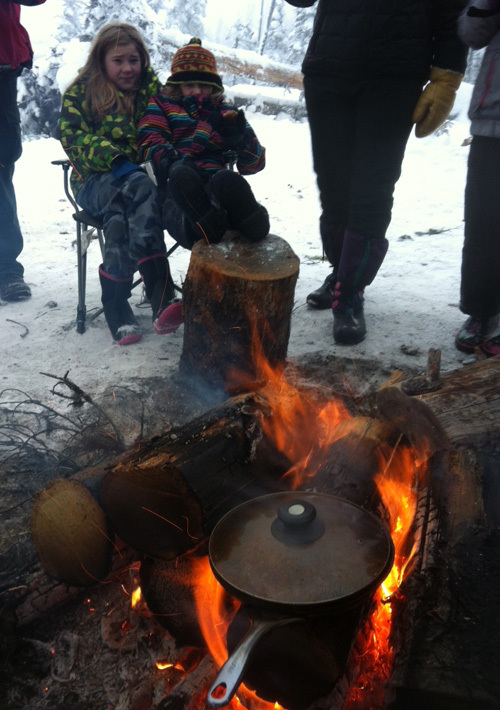 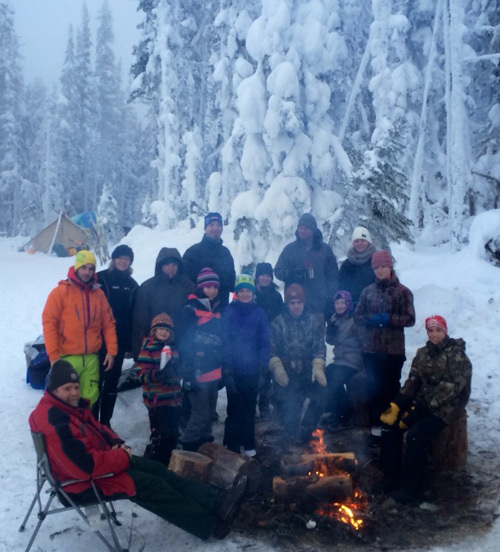 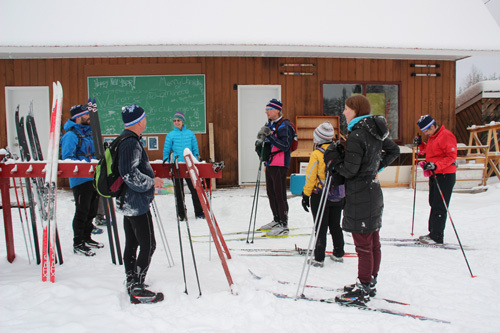 The tests proved vital and revealed many best practices for staging events to bringing children to the snow. 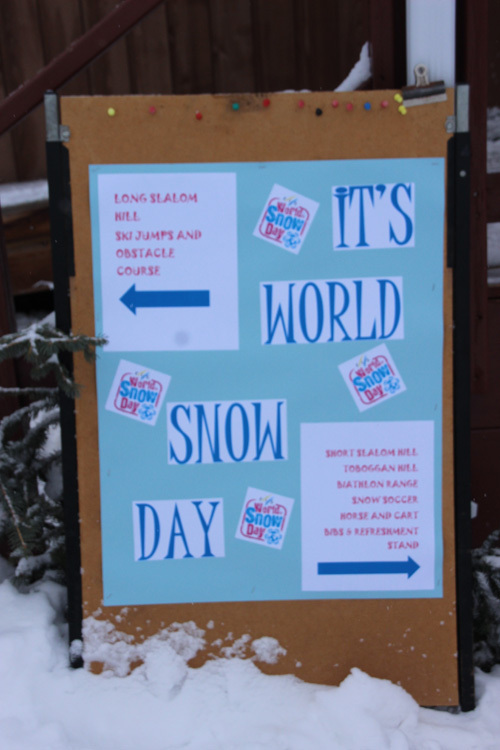 In 2012 these best practices where carried over to the World Snow Day project. 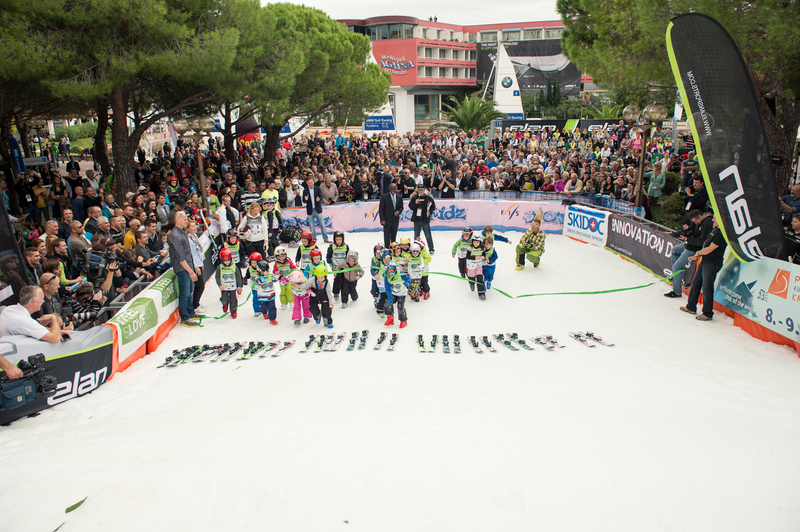 In the short space of 3 years World Snow Day grew to over 600 Organisers in 45 countries and more than 500’000 participants. 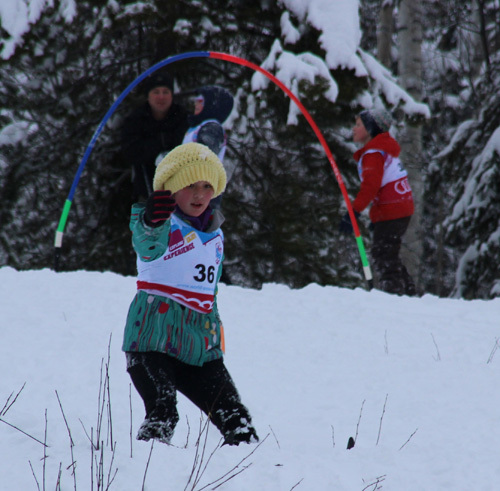 The event took off and continues to do so with the 4th edition on the 18th January 2015, seeing 645 events in 45 coutnries. 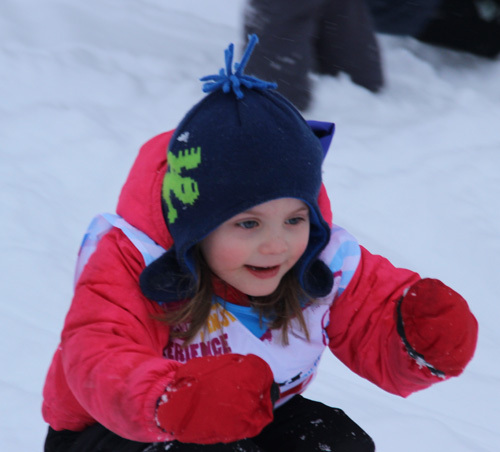 However the rapid rise of World Snow Day opened up an opportunity for SnowKidz. 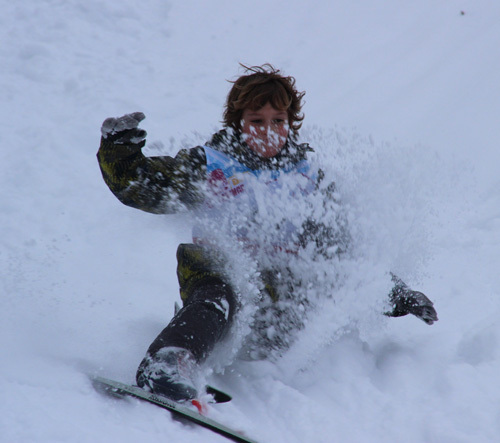 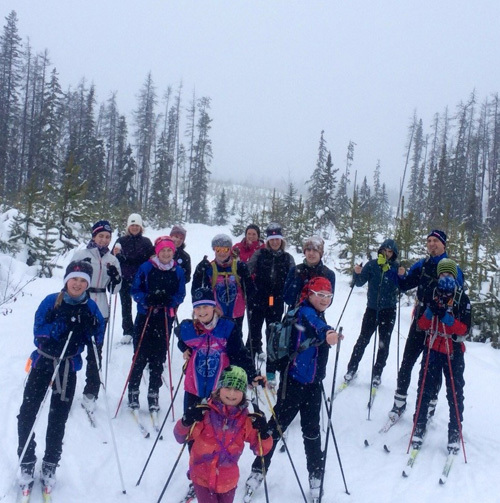 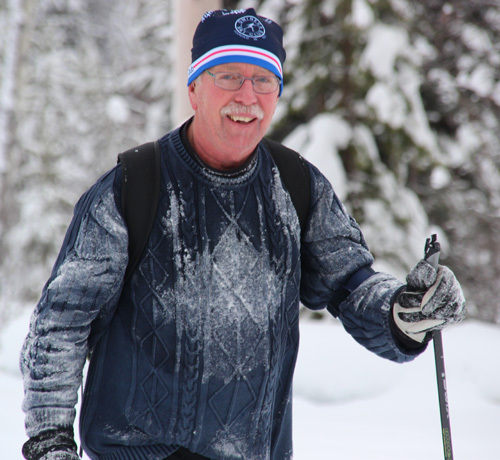 ”It is great to have children enjoying snow sports for one day, but it is even better when they enjoy it through out the season” commented Bring Children to the Snow Coordinator, Andrew Cholinski. 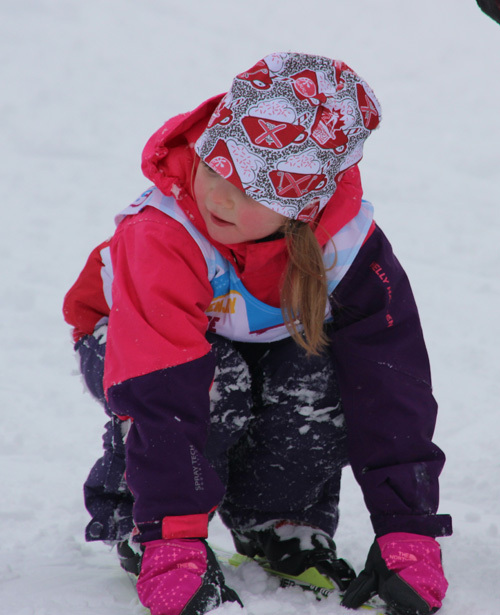 With this mentality the SnowKidz program was restructed and offered the same benefits as World Snow Day but in a flexible programme. 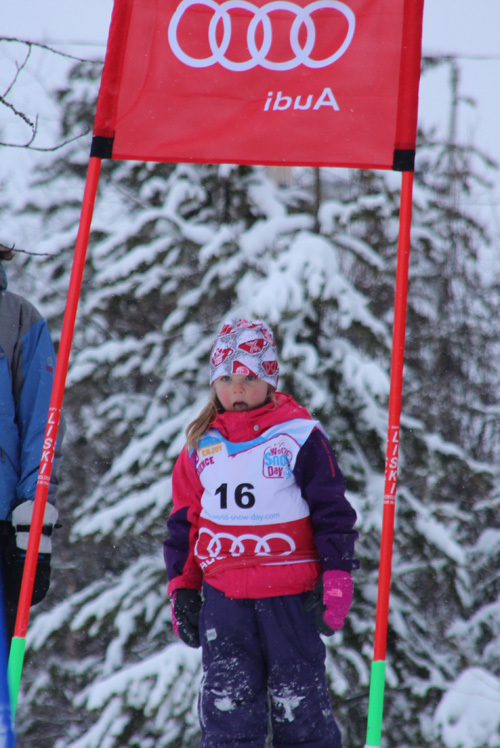 Since the restructure in 2013 the program has taken off. 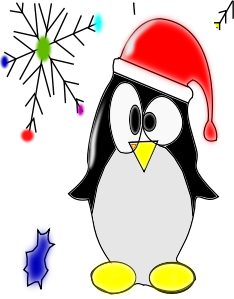 On the 16th December 2015 the project surpassed 1000 events. 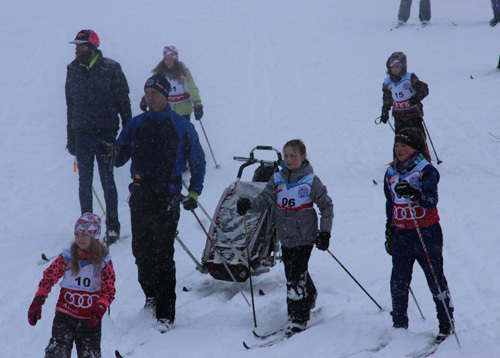 Some of the events which have taken place include free and 5euro lift passes for school children throughout Austria, Alle pa Snow (Everyone on Snow) throughout Sweden, Kids on Snow Tour through out Germany, Europa-Park SnowKidz (GER), Burton Riglet Park Tour throughout Beligum, Wintesport Expereince throughout Netherlands, SnowKidz Temple Basin (NZE), Stream SnowKidz Race (CHI), Three and Free at Killington and Pico Mountain (USA), Ski 4 All throughout Portugal and many more. 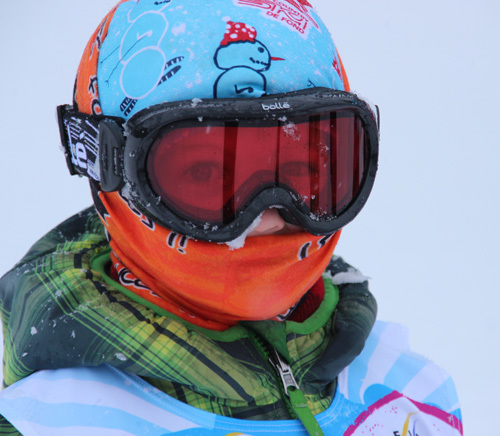 Visit www.snowkidz.com now to find out more! 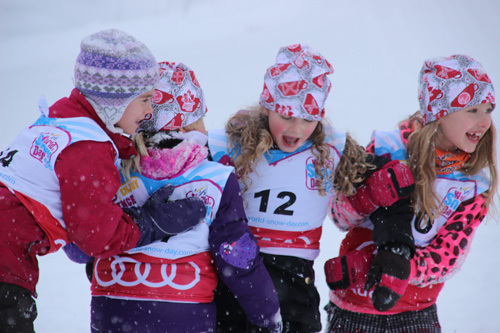 Want to receive OSC Bulletins or our Newsletter?